How Will African Teams Perform At Next Month's FIFA Soccer World Cup? 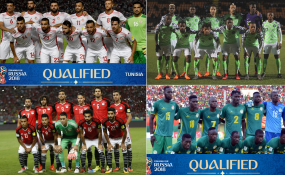 Tunisia, Nigeria, Egypt and Senegal national teams. The Kogi Government says it has concluded arrangements to establish 25 viewing centres where people can watch live World Cup matches holding in Russia. The government said on Tuesday in Lokoja that the centres would be located at the headquarters of each of the 21 local government areas in the state. Mr. Kingsley Fanwo, the Director-General, Media and Publicity to the state governor, who made the disclosure, said the centres would be located in areas that were easily accessible and secured. According to him, all the centres will be equipped with cable TV subscription, projector, screen, standby generator and other accessories. He added that the government had already taken delivery of all the items for onward delivery to the designated centres in all the localities. "The government will also ensure constant fuel supply and train attendants to man the centres. "The Nigeria Police and other security agencies have been contacted on the need to provide security for viewers at the centres and forestall any form of violence," he said in a statement. He urged football fans to look forward to an uninterrupted entertainment throughout the Coupe de Mundial, courtesy of the government. Nigeria's Super Eagles are in Group D alongside the Albiceleste of Argentina, Iceland's Strákarnir Okkar (Our Boys) and Vatreni of Croatia.